South Korean President Moon Jae-in and North Korean leader Kim Jong-un will meet for the third time during the inter-Korean summit from September 18 to September 20 in Pyongyang. As per Yonhap News Agency, Moon’s special envoy Chung Eui-yong, who returned from Pyongyang late Wednesday, confirmed the South Korean president’s visit to North Korea. “First, the South and the North agreed to hold a South-North Korean summit in Pyongyang between September 18 to September 20, and to hold high-level negotiations early next week to prepare for the summit,” Chung said. A five-member delegation to Pyongyang was headed by Chung and also included the director of the National Intelligence Service, Suh Hoon, and Vice Unification Minister Chun Hae-sung. The trip to North Korea was largely aimed at setting the date for the third Moon-Kim summit. This will be the third summit between the two Korean leaders. The two, first met in the border village of Panmunjom on April 27, then again on May 26. Chung said that the forthcoming summit would review the implementation of the inter-Korean summit agreement signed between the two countries during the first meeting in Panmunjom. “The countries agreed to review the implementation of the Panmunjom Declaration and discuss the future direction of its implementation, and to discuss practical ways to establish lasting peace and ensure joint prosperity on the Korean Peninsula, especially denuclearise the Korean Peninsula,” he said. Chung further informed that the North Korean leader has reaffirmed his commitment on denuclearisation and to work closely with the United States on the same. 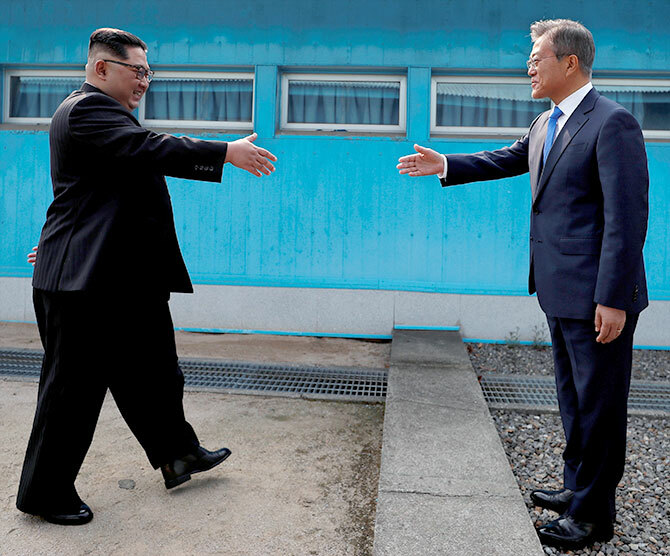 This will be Moon’s first visit to North Korea as a head of the state, although, during the April meeting, the South Korean President had briefly crossed over to the other side of the inter-Korean border with Kim.